Having grown up with a school teacher for a mother, and also having spent many years beyond high school in various classrooms getting my own education, saying thanks to a teacher comes high on my list. Tuesday Throwdown has a new challenge starting today and our theme is "Thank Your Teacher." We're sponsored by Bugaboo Stamps, who generously supplied images to the DT members. I'm using "SBTeacher", and Sun Bonnet is one of my favorite characters at Bugaboo. I'm playing with the green/brown combo again and I still like it. :-D Sun Bonnet is colored with Promarkers, then die cut and matted with two different mats. Both ribbons and all the flowers are from my stash. The sentiment is computer generated and die cut. Everything is mounted on a blank card base of spring green. Southern Girls -- buttons, badges, OR Flair! Love this image, NC. Your grand daughter has good taste ... and a great sense of gratitude! She has good "teachers"! 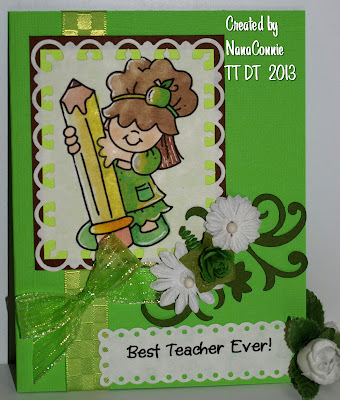 Awww..what an adorable card, and perfect image for a teacher thank you card. Great coloring and design. This is so cute NC. Your design and colors are so pretty and I love those die cuts. Oh so pretty! I just love all the green cards you do and this is no exception! That shiny ribbon is perfect for this too. Love it. This is super cute. Love the colors you have used for your awesome card! Fabulous card! Thanks for joining us this week at Tammy's Scrapin' Corner with your lots of layers card. Hugs! Oh, NC, this is fabulous and so cute. Thanks for stopping by and leaving the luv. No worries. I missed you. Gorgeous card and lovely image! Beautiful design too Connie. Hi NC, I just love the colors that you have chosen and those ribbons are fabulous. thanks for stopping by earlier. I do appreciate the support. Such a cute little card :) Thanks for joining us for the Dare To Be Sassy Thursday challenge. Such a fun image for a teacher's card. Thanks for joining our challenge over at Docerela Creations! Sweet little card NanaC. I love the green/brown colour combo! Nanna, so glad to see you joining us this week. I love the image and sentiment too. Thanks for joining us this week for Lots of Layers. Perfect image for a teacher. Adorable card and one sure to be appreciated by your granddaughter's teacher. I'm sure teachers love to know they are appreciated. This is just darling and what a wonderful color combo! Thanks for joining us at DRS Designs! I love the Green and that sweet image. Wonderful Card!thank you so much for sharing with QKR Stampede this week. Such a sweetie card, and a wonderful year-end thank you, too. Do you miss teaching, or are you still teaching part time? Your little embellies are sweet (and as always, you come up with the best of sentiments"
Very sweet! Any teacher would be proud to get that card! Just lovely! Thanks for sharing with us at Sassy Studio Designs this week. Awesome csrd for a teacher!! Thank you gor joining us at DRS Designs! What a lovely card. Fantastic color choices and design! Thanks so much for joining us this week at Delightful Challenges! This is just beautiful.. Love all the embellisments that you have added to the card.. Fabulous.. Thanks for joining us over at TSC..
Fab card ! Love the card! Hugs from your TT teamie!